The cranial nerves are 12 pairs of nerves that can be seen on the ventral (bottom) surface of the brain. Some of these nerves bring information from the sense organs to the brain; other cranial nerves control muscles; other cranial nerves are connected to glands or internal organs such as the heart and lungs. V Trigeminal Nerve Somatosensory information (touch, pain) from the face and head; muscles for chewing. VII Facial Nerve Taste (anterior 2/3 of tongue); somatosensory information from ear; controls muscles used in facial expression. IX Glossopharyngeal Nerve Taste (posterior 1/3 of tongue); Somatosensory information from tongue, tonsil, pharynx; controls some muscles used in swallowing. XI Spinal Accessory Nerve Controls muscles used in head movement. Note: the olfactory "nerve" is composed of the rootlets of olfactory hair cells in the nasal mucosa and is not visible on the ventral surface of the brain. The rootlets end in the olfactory bulb. 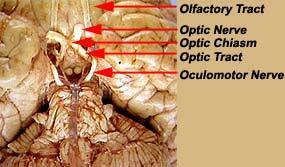 The olfactory tract contains nerve fibers projecting out of the olfactory bulb to the brain. The images in this table have been adapted from those in the Slice of Life project. olfactory, optic, oculomotor, trochlear, trigeminal, abducens, facial, vestibulocochlear, glossopharyngeal, vagus, spinal accessory, hypoglossal. Still can't remember the cranial nerves? Perhaps you need some Cranial Nerve Bookmarks to help you study! After you print the bookmarks, cut them into three individual bookmarks and use them to mark your place when you study. Now that you know the names and functions of the cranial nerves, let's test them. These tests will help you understand how the cranial nerves work. These tests are not meant to be a "clinical examination" of the cranial nerves. You will need to get a partner to help...both of you can serve as the experimenter (tester) and the subject. Record your observations of what your partner does and says. Gather some items with distinctive smells (for example, cloves, lemon, chocolate or coffee). Have your partner smell the items one at a time with each nostril. Have your partner record what the item is and the strength of the odor. Now you be the one who smells the items...have your partner use different smells for you. Make an eye chart (a "Snellen Chart") like the one on the right. It doesn't have to be perfect. Have your partner try to read the lines at various distances away from the chart. These three nerves control eye movement and pupil diameter. Hold up a finger in front of your partner. Tell your partner to hold his or her head still and to follow your finger, then move your finger up and down, right and left. Do your partner's eyes follow your fingers? Check the pupillary response (oculomotor nerve): look at the diameter of your partner's eyes in dim light and also in bright light. Check for differences in the sizes of the right and left pupils. The trigeminal nerve has both sensory and motor functions. To test the motor part of the nerve, tell your partner to close his or her jaws as if he or she was biting down on a piece of gum. To test the sensory part of the trigeminal nerve, lightly touch various parts of your partner's face with piece of cotton or a blunt object. Be careful not to touch your partner's eyes. Although much of the mouth and teeth are innervated by the trigeminal nerve, don't put anything into your subject's mouth. The motor part of the facial nerve can be tested by asking your partner to smile or frown or make funny faces. The sensory part of the facial nerve is responsible for taste on the front part of the tongue. You could try a few drops of sweet or salty water on this part of the tongue and see if your partner can taste it. Although the vestibulocochlear nerve is responsible for hearing and balance, we will only test the hearing portion of the nerve here. Have your partner close his or her eyes and determine the distance at which he or she can hear the ticking of a clock or stopwatch. Have your partner drink some water and observe the swallowing reflex. Also the glossopharyngeal nerve is responsible for taste on the back part of the tongue. You could try a few drops of salty (or sugar) water on this part of the tongue and see if your partner can taste it. To test the strength of the muscles used in head movement, put you hands on the sides of your partner's head. Tell your partner to move his or her head from side to side. Apply only light pressure when the head is moved. Have your partner stick out his or her tongue and move it side to side. Cranial Nerve Information from Yale University. More details about the cranial nerves. A great cranial nerve review with quizes.